I think ice cream might be my most favorite desert. There is always rooms for ice cream or froyo in my opinion. Whenever we go out to eat, no matter how amazing the restaurant is, we pretty much always pass on their dessert and instead grab ice cream on the way home. I think my last meal would include avocado toast, fish tacos and ice cream. Maybe if I was being greedy, I would throw in a soufflé for good measure. But definitely ice cream of some sort. 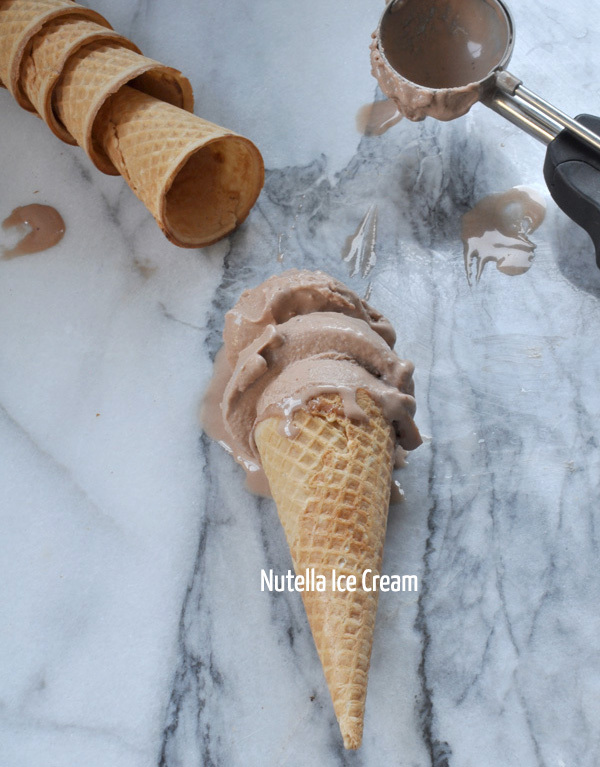 I would happily eat this Nutella ice cream as part of my last meal or after any meal for that matter. Not only is it incredibly easy - with just 3 ingredients, coconut milk, sugar and Nutella. It is out of this world delicious. Coconut milk makes this all sorts of creamy and the Nutella adds one of my most favorite flavors. If Nutella isn’t your thing (how could it not be!?!? ), you could use any other topping or flavoring, like salted caramel or chocolate. So go ahead, I dare you to make this ice cream and tell me you don't love it. In a medium saucepan over medium heat combine coconut cream and sugar and bring up to a simmer, stirring occasionally. Once it simmers, remove from heat and allow it to cool to room temperature. In a blender, add ice cream base and as much Nutella as you want. Blend on high for about 30 seconds or until Nutella is mixed in. Place in a container to cool in the refrigerator for about 2 hours or over night. Once cold, add ice cream base to ice cream maker and follow directions to freeze. When frozen, remove and eat with wild abandon.